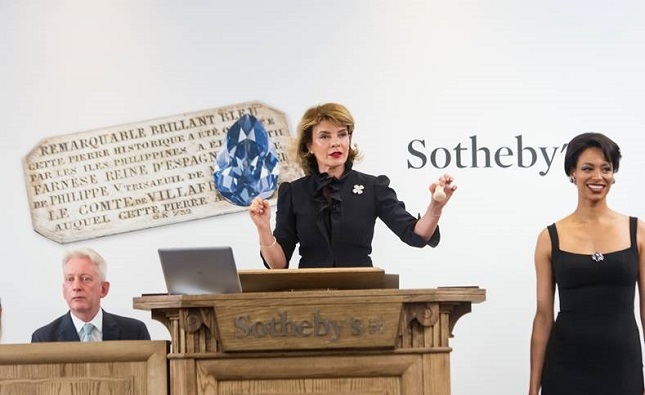 An historic diamond known as The Farnese Blue, sold for $6,713,837, well above its pre-sale estimate of $3.6 million – $5.2 million. Given to Elisabeth Farnese, Queen of Spain, as a wedding present in 1715 and subsequently passed down through four of the most important royal families in Europe, the 6.16-carat pear-shaped blue diamond was on the market for the first time after three centuries in the same family. In addition, there were two other white diamonds: a 51.71-carat round diamond and a 50.39-carat oval diamond, which both sold above their high pre-sale estimates for $9,251,851 and $8,123,845, respectively. Discovered in Botswana, they are D-color, flawless and Type IIa. Bidders from 50 countries took part in the Magnificent Jewels and Noble Jewels sale which also saw strong results for other white and colored diamonds, signed pieces and jewels with aristocratic provenance and concluded with a combined total of $85,629,630.